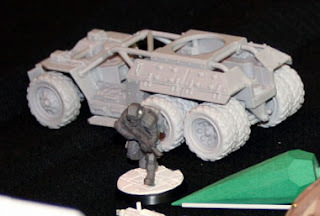 Imperial Guard Vehicles on the Block A few vehicles, perfect for an urban setting. 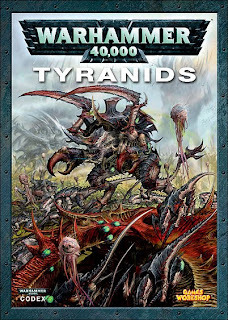 Tyranids: 3 new plastic and 3 new metal kits. The new codex is supposed to give you only horde options instead of biomorph options. 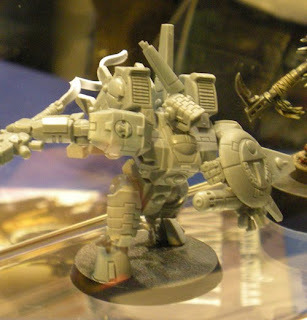 I’m not sure what that means, but I’m thinking more gaunts, less options, cheaper point costs. GW has just released a space hulk faq! 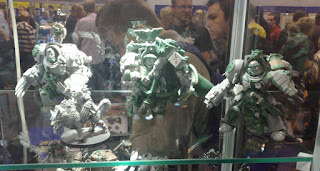 New Skaven codex and perhaps models in November 2009. Rogue Trader (a new pen and paper rpg) is shipping to disributers in a week. I looked at some of the features in this game and holy cow, it looks FUUUUUN. If you’re into warmachine, try out the new rules! You can beta them for free right now. Privateer Press has announced the date of Hordes mk II rules, beta field test date 24 November 2009. it is unconfirmed whether or not hordes mk2 will be compatible with warmachine mk2. Battletech rpg opens up in beta for $10. You have the possibility of submitting stories to them to be publicized. I made another donation to the campaign of Rand Paul this morning. Rachel Maddow makes me bite my lower lip… in a good way. Here’s the civil and enlightening interview she had with Rand Paul. What’s going on here is that the Republican party betrayed its own values. What’s seen as “internecine warfare” is really just a purification process. As a small business owner I can say without reservation that the federal government is the mortal enemy of the small local businessman. The city fixes the potholes in front of my shop. The Feds buy F-15s and fly them over the desert on the other side of the world. Or bail out banks (shudder). 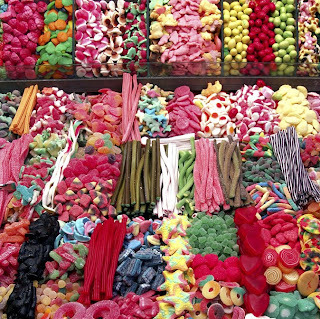 Visit the Candy Shop. New models for sale will be up today. Advance Scout Paul brings us these images and links from around the immaterium. Thanks! Also a thank you to http://www.warseer.com/ Check them out! I have also sprinkled in my own opinion, which of course is an invaluable addition. 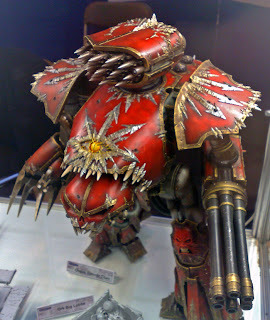 Chaos Revenant Titan. This model is an insane project to undertake. But it looks completely wicked. Supposedly some kind of Elysian buggy. Not too thrilled here. Elysians are pretty scrawny. But they have a cool back story. 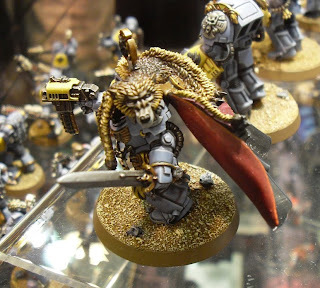 You can make a whole army of them (using the Imperial Guard codex) ordering through Forge World. I love the Drop Sentinels. They have their own army list, too, in Anphelion Project. 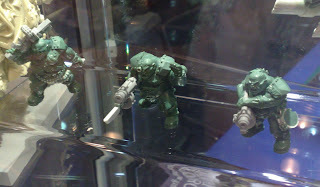 Tallarn greens. 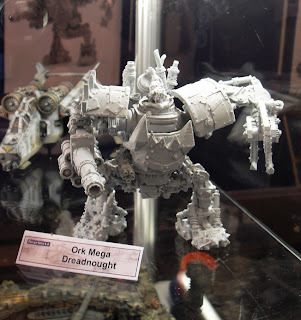 I’d be glad to see this resin Forge World line flushed out. 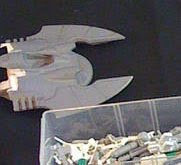 Supposedly some kind of turret for an Eldar super-heavy. I’ve never seen it before. 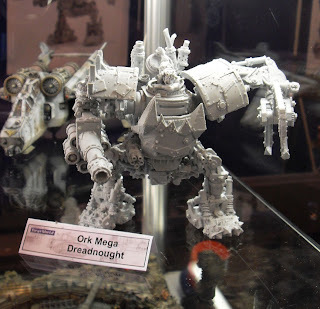 Ogryn greens. Will these be plastics? 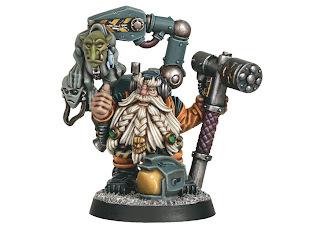 Currently the metal/plastic O’Shovah is a direct/bitz order only item. I like this one a lot better. The current model is pretty static. 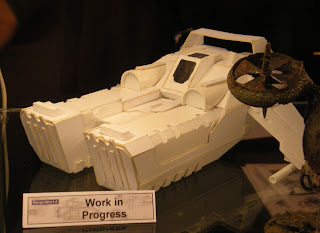 The color of the Seeker is due to the fact it is a resin prototype. It isn’t painted merely cast from a translucent dark redresin. The black is where the resin is too thick for light to shinethrough. 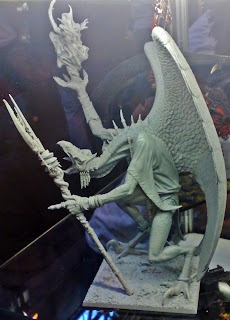 There is also a pic floating around of the Deamon Princefrom the WoC book in the same resin. Something to do with Elysians I bet. Lord of Change is on display again.Chaos Reaver is looking good with a fresh paintjob.A Elysian buggy of some type.A smallish one-man Eldar Falcon looking piece (probably a super-heavy turret work in progress). 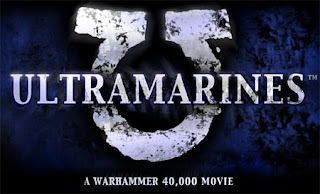 Oh and they’re making a 40k movie called ULTRAMARINES, direct to dvd 70 minutes. OK now for release rumors! 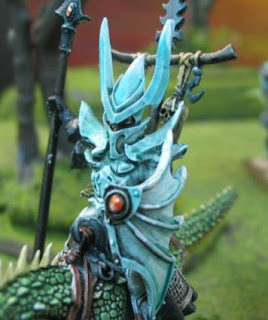 There was a dark eldar codex that was sent out for playtesting in the UK, but ended up not being powerful enough, so it went back to the drawing board. They’re expecting 2011 currently. 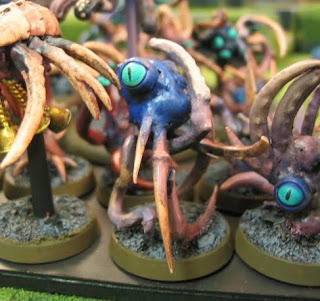 After tyranids, they’re going to release a necron codex, then finally the dark eldar. So that’s about all I have right now. 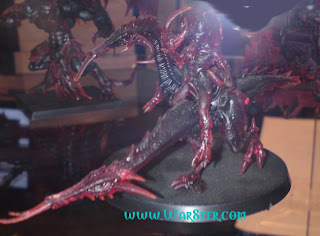 I am subscribed to almost 200 gaming blogs and forums, mostly GW products. I’ll shoot you emails from time to time with things I find if it’s helpful. 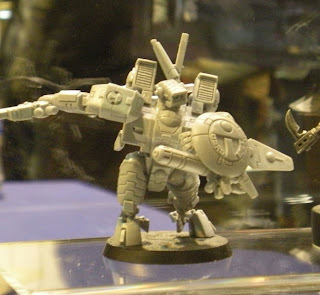 Rumor has it this is coming early 2010, possibly January for the first wave. This reminds me, I need someone (if such a thing exists) to feed me rumors and good stuff from over the net. Sort of a Reporter. Another glorious Sabbath Day has passed. This one was particularly good. My wife made pancakes with macadamia nut chunks in them. Lots of butter. Lots of syrup. Yummers. We tidied up the downstairs. J had dumped some soup in the shag carpet and that started smelling like vomit. One way or another I am getting rid of that carpet this week. It is foul to the core. Then off to church with the older kids, which was a relaxing delight. I actually got to listen to the speakers. We got there moderately on time for a change as well. I don’t know how to describe it. I was just relaxed the whole time. The whole day was just a joy. I went home teaching in the evening, both families doing well. I have a new HT companion named Richie. He is working as an assistant manager, but his real passion is speakers. Building custom speakers. It’s all greek to me. But it seems that he should be making a living doing that, the thing he loves and is useful to society. Richie is like Clark Kent: mild mannered, unassuming, but with a half-smile and a heroic nature. He has black hair, strong chin, and horn-rim-type-rectangular-lisa-lobe-type glasses. And some stubble you could sand your deck with. In Sunday School the lesson was A Mission of Saving. It occurred to me that Brigham Young didn’t whistle in his white steed, jump on, and gallop off to the rescue. He organized things. Each person had a smaller assignment in the big picture. It was a group effort. I just got a little insight into leadership, because I tend to just want to do everything myself. I call it “giant pulsing brain syndrome”. I watched two episodes of Warehouse 13 with my wife. I ate some cookie and cream ice cream. I had a dream the other night. I was walking down Siskiyou boulevard into Ashland, where the trees are large and shade the road. This is a common element. I notice that the dandelions have grown very large, and in this one yard they are a small forest of them, about eight feet tall with wrinkled and hard green trunks, gently curving. Their heads were a full sphere of seed pods larger than a basketball. 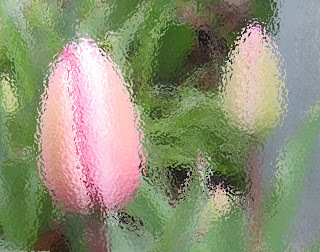 As I peered into the yard I could see the soft-glow outlines of party-goers, in ballroom regalia and masks, and the clinking of glasses, and the murmur of voices. It sounds like a lot of fun, but I must move on. I have somewhere to be. 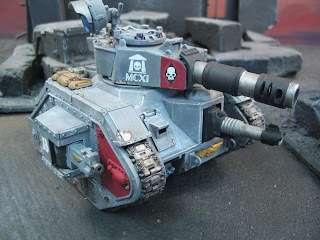 Turbo Armies This is our best deal. You pick army and point level, we get it painted up. Stay tuned, I will be adding more armies to the list, and will do so on request. Pandora’s Armies We pick everything, even the army you get. You pick what game system and three armies you don’t want it to be. Basic Training Get an army the cheapest possible. This is pared down to the minimum. As with all these specials we promise to deliver something reasonably competitive and fun. For Sale These things are available immediately. You can buy them off the website directly OR just email me at bluetablepainting@gmail.com to set it up. Trade-in I am now paying ca$h for models. It’s not much, but I will absorb the lot with no hassle. Still a few copies left. Click link for details. 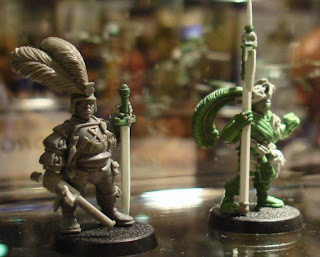 Trade-back (get a credit equal to 20-50% of the value of an army you have bought from us to apply to a new army– this includes the models, assembly and painting). Some short notes about today. I have a ton of video to edit: Sundae Monday, Notreps, Morning Show, army features etc. 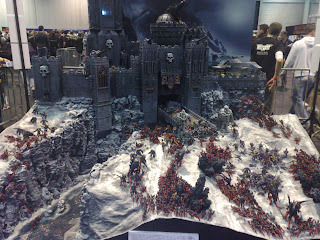 Vampire Counts army still for sale. Would drop it by $50 for payment by tomorrow OR by check. Played a 2500 pt game with the Tzeentch Daemons army. That thing is a load of fun. Booking projects now for October. Ready whenever you are. Still two copies of Space Hulk available. Don’t be crying when they all run out. I just wanted to let you know that my Nurgle WoC army arrived in the post today! It’s beautiful! Thank you so much, it looks as good in person as it did on video, if not better! I’m very, very pleased! I haven’t gotten a chance to go over everything yet and get a good close look, but it’s all out of the wrapping and good to go. Now, of course as expected, there are a few instances of breakage, but nothing too major and certainly nothing a little superglue won’t cure! Awesome, Shawn, truly awesome. It’s an amazing looking force and I couldn’t be happier with it. Thanks to you, and the whole BTP crew, my friend! I look forward to expanding upon this army with you, and future business together!